Every time you wash your hands or do some intense manual labour, massage your hands with vegetable oil or Vaseline. Soak hands in a bowl of warm water to which 1 tsp. of cornstarch has been added for 5 minutes daily after finishing the house-hold chores. This will ensure that your hands feel smooth and silky. Before going to bed at night massage your hands with a blend of lemon juice and rose water in fresh butter. This will make your hands smooth and soft. Mix 1 tsp. of Glycerin, 1 tsp. of lemon juice and 5 drops of rose water and rub it on the hands every night during winter months. This will keep your hands soft and prevent chapping. 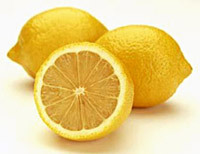 To remove stains from hands rub with a slice of lemon or a raw potato. For nicotine stains, apply lemon juice and leave for 10 minutes before washing. Cucumbers are also known for their smoothening characteristics. Mash a cucumber and massage your hands with the mixture. After 10 minutes, wash off the mash and repeat if needed. If your elbows are dark and hard, mix glycerin with lemon juice and apply on the area. Always wear rubber gloves lined with cotton when your hands are in contact with harsh soaps, detergents or chemicals. Wear gloves when doing work that might damage the hands or nails, such as gardening or shoveling snow. After washing your hands, pat dry and, while moist, use a moisturizer on the hands, cuticles and nails. Chemically enhanced moisturizers that contain urea of lactic acid are even more efficient in binding water to the skin. If your hands must be in and out of water frequently apply a silicone or a similarly based protectant film that sheds water over the hands and nails. If nails darken despite good cleansing habits, a drop of lemon oil massaged twice weekly into the nail plate may work but must not be overdone or irritation of the surrounding skin and drying of the nail plate may occur. Nail polish protects the nail from stains, physical trauma, and acts as a barrier to chemicals. But don`t overuse it or it may stain and dry nails, particularly if nail polish hardeners are used frequently. A base coat will allow your polish to last longer. If your nails are dry, soak them for 10 minutes twice daily in warm water, pat dry and immediately apply one of the chemically enhanced moisturizers that contain urea, lactic acid or glycerin oil. Sculpt and shape your nails by filling in one direction with a very fine file. Avoid vigorous up and down or back and forth motions which may tear apart the various layers of the nails. Avoid sharp angles. Attend to small cracks, snags and breaks immediately. Treat yourself to a weekly manicure if possible. It is relaxing and keeps the nails healthy looking and attractive. And remember to do the same with your toenails. As they age, the nails thicken, grow more slowly, repair poorly and are susceptible to various skin diseases. Watch for changes and see your dermatologist early enough to treat problems. Avoid digging blindly into a drawer or purse where a sharp object may crack or break the nail or harm the delicate skin around the nail. Avoid using the nails to do pick-up tasks. Use the soft ends of the fingers rather that the fragile nail; they will soon chip and break if used this way. Avoid gluing on false or molded nails; allergic and painful reactions may occur. "Mending paper" or tea-bag paper can be used to bridge large cracks. Do not reapply nail hardener or polish more often than necessary; these agents can discolor nails and make them brittle if overused. Try to repair your manicure rather than replace it. Avoid chipping and peeling off nail polish. Do not bother adding gelatin and calcium supplements to an otherwise well-balanced diet. They have no know positive effects on the nails despite certain claims. Do not use too many polish removers. Apply moisturizer after using nail polish remover in order to minimize the irritating and drying action of the acetone. Do not grow excessively long nails; they are too prone to breakage. Wrapping nails is laborious and is difficult to do without help. Avoid this technique unless your nails are particularly prone to breaking. Do not push back your cuticles too vigorously or you will harm the growing moon of the nail. Push them back only when the skin around the nails is warms and wet and therefore softer and easier to manipulate. Avoid applying sharp instruments under the nails. They might break the nail to skin bond. Do not ignore nails that separate from beds (it may be due to iron or thyroid deficiency), nails that thicken (it may be fungus infection) or pit (it may be psoriasis. See your doctor. The nail and skin reflect internal well being or disturbance. Amino acid complex, vitamin C, vitamin E and biotin taken together will help the body build keratin which infact improves the overall health of your nails. Ridges in the fingernails are a sign of insufficient B vitamins. Hence include vitamin B in your diet. Calcium and bone building formulas will benefit the nails by supplying much-needed minerals. A paste made with alum and water is effective in relieving ingrown nails. If you have swollen and painful fingernails, then put a piece of fresh lemon to the infected area and it will work as magic. Tea tree oil, garlic oil and calendula ointment are the best treatments for nail fungus. Also wear gloves while cleaning and keep your fingernails short.